You might have seen this image before – it’s been floating around Facebook for a while. 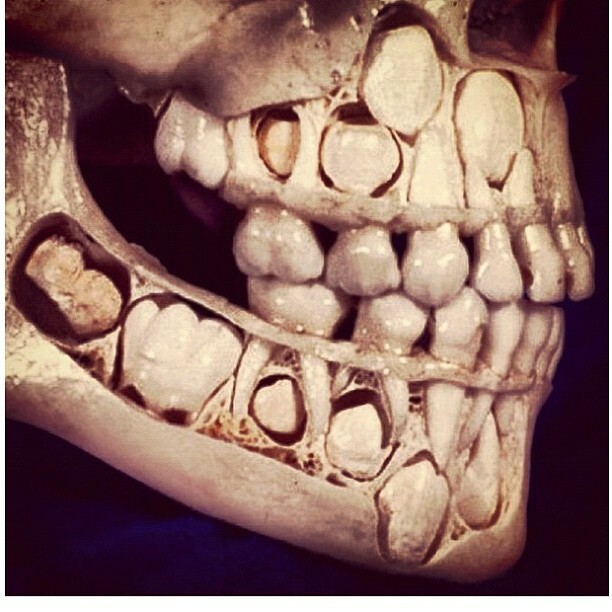 This is what a child’s skull looks like before they lose their baby teeth. A couple of weeks ago, I wrote about my baby girl’s recent clingy, grizzly and generally unsettled temperament of late, and yesterday I discovered the exact cause. Little Chop has six teeth so far, four up top, two on the bottom, each pre-empted by a few grizzles the week before which passed quickly as each tooth erupted. This time around the grizzles have gone on for three weeks and counting. A few days ago I noticed Chops pawing at her cheek, then again the next day and again the next day. So, yesterday I decided to check out the teething situation by sticking my finger in her mouth and having a feel of her gums…bad move. She bit down. Hard. I think the neighbours heard me yelp. I changed tactics and lurched in with the tickle monster. Bingo. Mid-laugh, clearly visible from her wide-mouth grin were four pearly corners of a molar buried in a swollen red gum. My baby girl’s first molar! May I remind you of the picture above. Can you imagine all the pressure that’s going on inside a toddler’s jaw? Yeah, I don’t want to think about it either. I just hope it breaks through soon – we could really use a good night sleep around here.